Once you found the perfect partner to share your life your next step is planning a perfect wedding. Every couple's dream is to make their wonderful wedding day a lively, memorable one. 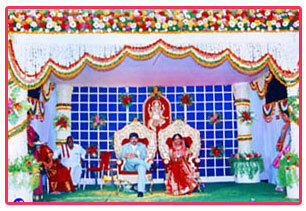 Though the traditions and customs of wedding ceremony differ with the country, religion etc. everyone's ultimate wish is to have a beautiful, well planned wedding. In order to have that "perfect wedding" with all the proper arrangements from wedding invitation card to reception hall decoration, you might need some help from an expert in the field. That is where professional wedding planners' service would be beneficial to you. Mr. D.Rama Rao the founder of Delight Wedding Planner, being a professional in the wedding industry, has vast experience of more than 40 years in this field. While being the proud owner of this useful web site, Mr. D.Rama Rao is specialized in Wedding Stage Decoration, Catering Services, Flower Name Board and wedding planning widely. He has done around 2000 weddings in around all india. Mr. D.Rama Rao’s main intention is to provide comprehensive wedding packages to the india , who are residing abroad as well as the foreigners who are longing to have a complete and wonderful wedding function. If you want to get planned your wedding perfectly according to your dreams and your budget then the ideal wedding planner that you should go for is Mr. D.Rama Rao, as he wants everyone to carry a smile on their faces when leaving from us after a heart's content wedding ceremony. .